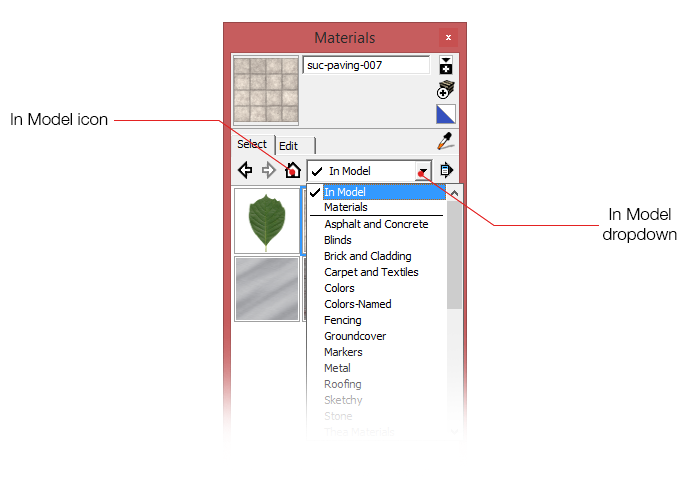 Any materials applied to your model, whether displayed or not, are found in the Materials Panel. You will notice a Home icon, which displays all the materials currently added to your file and in the dropdown menu you can see In Model which also lists the materials added to your file. From the In Model listings choose a material you want to edit and then click the Edit tab. In this panel you have 3 primary areas of a texture that you can edit - Color, Texture and Opacity. 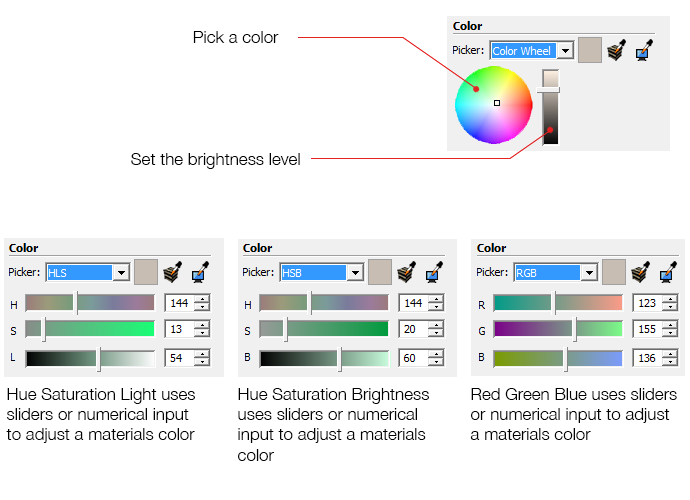 The Color edit area allows you to change to overall color and brightness of a texture using either the Color Wheel, HSL sliders, HSB sliders or the RGB sliders. Below you can see the effectiveness of using the color edit area to completely change the appearance of a texture in SketchUp. The are 2 other features of the color edit area and those are the sampling tools. Below you can see the remaining features of the color edit area - Undo color changes, Match color of object and Match color of screen. These allow you to sample colors from either objects in SketchUp or from anything currently on your screen. Below you can see how we sampled a color from the bottom texture to change the top texture's appearance. 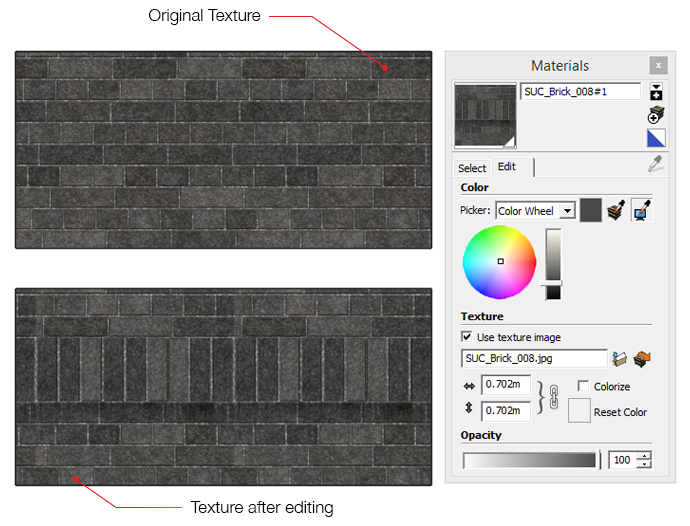 In the texture edit area there are some interesting features from which you can further tweak a texture's appearance in SketchUp. In the last tutorial we covered some of these features already so here we will focus on those related to editing a texure. The main editing features are - Use Texture Image, Open in Image Editor, Colorize and Reset Color. 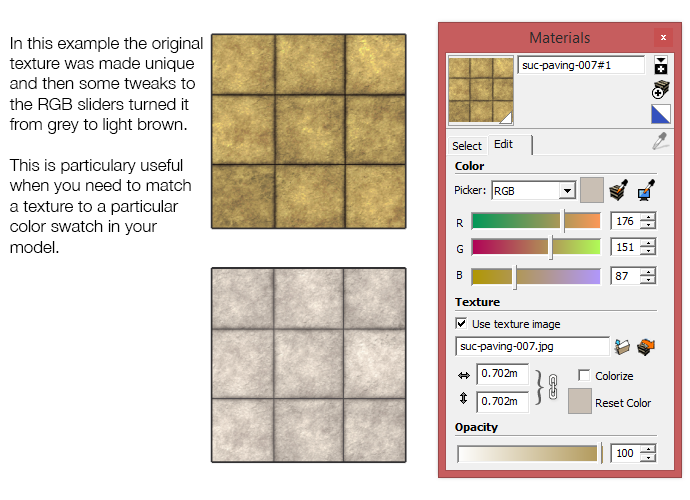 The Use Texture Image allows you to toggle the display of the texture by substituting the texture for a color. The color is derived from the overall hue of the image. Below you can see the original texture and the result when you toggle off Use Texture Image. NOTE: Toggling off the use of the texture will remove that texture from your SketchUp file. 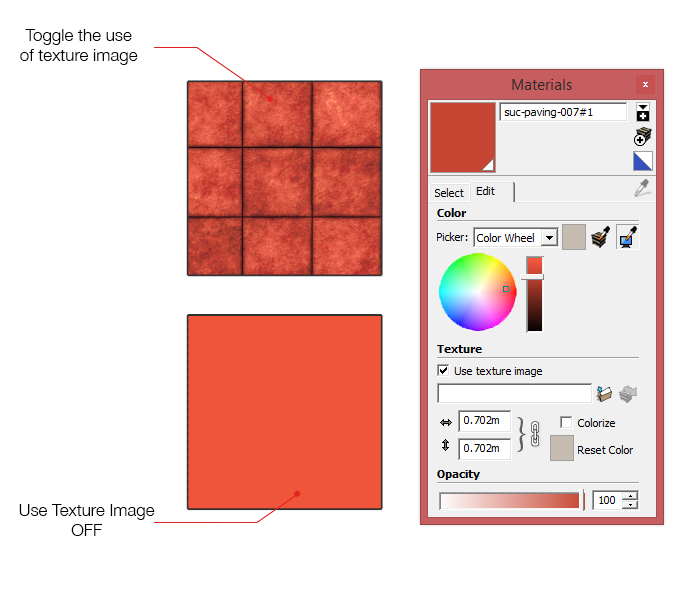 If SketchUp image editing features are not enough for you there's an option to export the currently selected texture to your Image Editor. Setting your external image editor is a pretty painless task. 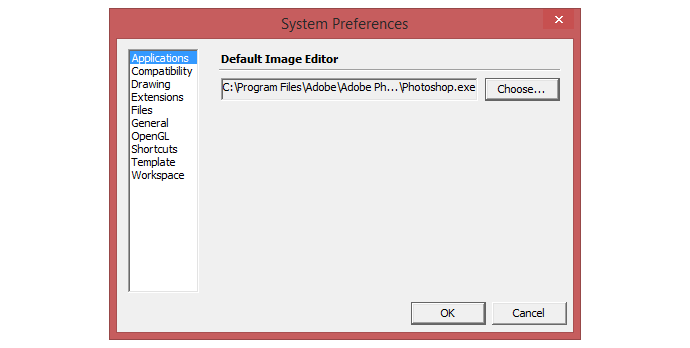 Just go to Window > Preferences > Applications to set the location of the .exe for your particular Image Editor. 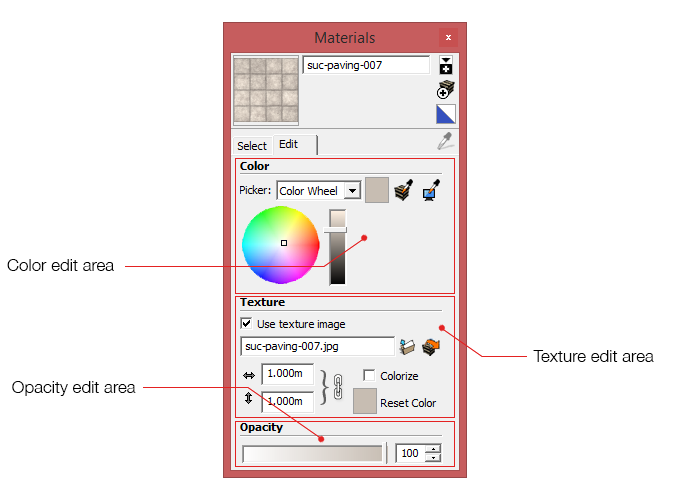 As soon as you choose to edit a texture externally SketchUp will place the image in your Temp folder. This allows you to edit the image and as soon as you save the image in your editor the material will update to the saved version in SketchUp. External editing is a tremendously powerful feature in SketchUp. 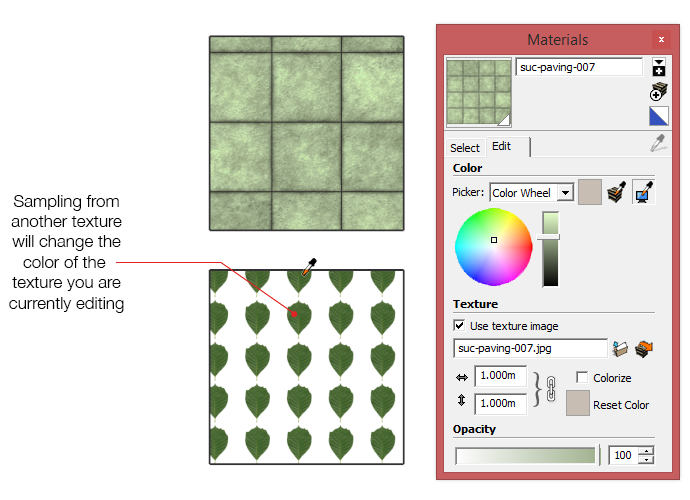 Having the ability to turn bland textures into something with more impact can transform your presentations in minutes. The last option in the texture edit area is the Colorize feature. Colorize is basically overlaying the new picked color over the entire texture. Because there are occasions where, when you change color values, certain pixels will inherit odd colors. Below is a classic example where changing the color of a texture results in less than appropiate outcome. The mortar in the brick has become a reddish/pink because of the use of blue to change the texture. An exaggerated example but one that clearly shows an unwanted outcome. How to fix it? Toggling Colorize typically colors the whole texture and fixes the problems that can occur from just coloring a texture. The down side to this is that it can also introduce somewhat unrealistic results....blue mortar? When you combine the ability to import just about any image into SketchUp and then edit its appearance the possibilties are endless.....! The last area is pretty straight forward. It deals with Opacity. Great for creating glass and water effects in SketchUp. 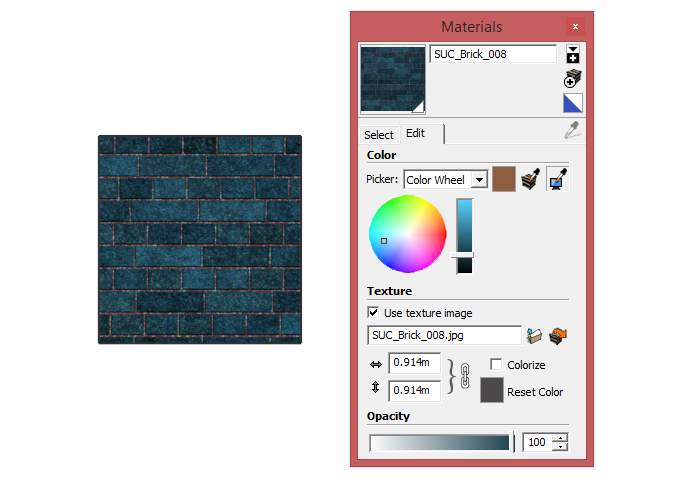 It is hard to believe that this small area within the Materials Browser can offer such control over your textures. Leveraging these extra functions can transform your models into beautifully presented works of art. When I apply any textures within a larger model, those textures end up applied to other surfaces as well. I wonder if there's a workaround. Hi Gord,It could be related to assigning texture to groups/components. Are the screens shown specific to the Windoze version? I use SU 2013 Pro on a Mac. Who do I ensure that when I export my drawing as a model (.dae/.dxf) that the textures and colors export correctly with the model?